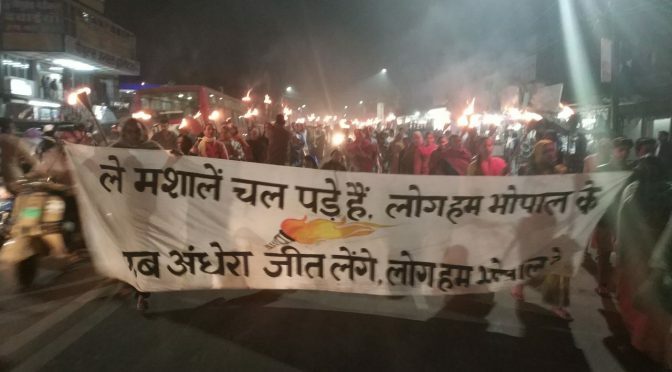 On the occasion of the 33rd Anniversary of the Union Carbide disaster in Bhopal, hundreds of survivors marched with flaming torches to the memorial statue of the gas affected mother opposite the Union Carbide factory. They paid homage to those killed by the disaster at the end of the rally. Residents of the communities next to the Union Carbide factory where the ground water is contaminated by hazardous chemical waste were also part of the march. Leaders of the five survivors’ organizations: Bhopal Gas Peedit Mahila Stationery Karmachari Sangh, Bhopal Gas Peedit Nirashrit Pensionbhogee Sangharsh Morcha, Bhopal Gas Peedit Mahila Purush Sangharsh Morcha, Bhopal Group for Information and Action and Children Against Dow / Carbide who organized the march demanded adequate compensation, clean up of environmental contamination , rehabilitation appropriate medical care and exemplary punishment of Union Carbide and Dow Chemical.